Below is the story of a man who had cataract surgery recently. 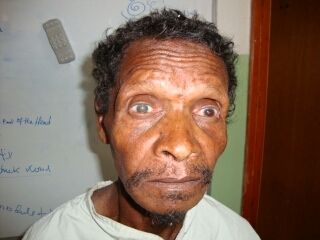 Ato Legese Hinsene is a 55 year old male patient who lost his vision for the last two years. He used to earn his living by taking care of the corn farm for a farmer. Two years ago his gradual diminished when he was not able to take care of the farm and lost his job. He was forced to leave the area and got place to stay in the nearby church compound. He said that he always expect food from other people to feed him self and he always wait for some one to take him to the rest room.This is the difficult situation in his life. Fortunately he had successful surgery and was very happy in the morning. He said he can take care of him self and life will incompletely different. In the western wollega region there are around 20,000 people like Legese who are waiting for possible surgery once in there life. Some will not have the chance to see again do to luck of the service. Thus your contribution will bring back sight to the hope less and of course change in their live and glory to our Lord.